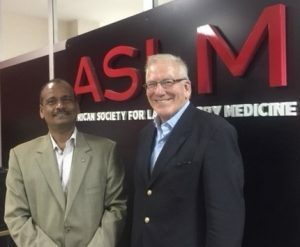 The African Society for Laboratory Medicine (ASLM) has formalised a new partnership with the International Federation of Clinical Chemistry and Laboratory Medicine (IFCC) and the African Federation of Clinical Chemistry (AFCC). On 17 March 2018, Dr Ali Elbireer, Chief Executive Officer of ASLM, met with Prof Howard Morris, President of IFCC, and Prof Rajiv Erasmus, President of AFCC, at the ASLM headquarters office in Addis Ababa, Ethiopia, and subsequently signed a Memorandum of Understanding to work together on a number of collaborative projects aimed at strengthening and improving the quality of laboratory medicine in Africa. The organisations plan to initiate a number of collaborative projects within the next year. Projects will encompass support for continuing education and training programmes for medical technologists and laboratory scientists and management training for laboratory directors, as well as training and preparation of laboratories for accreditation. This will be done, in part, through support of distance learning programmes and clinical and scientific conferences in Africa, and the development and promotion of national reference laboratories. In addition, the organisations will work together to promote the value of laboratory medicine in Africa as a means to improve clinical outcomes across the continent. One major focus will be on proficiency testing. ASLM, IFCC and AFCC will further collaborate with the diagnostics industry to establish proficiency testing programmes and ensure the availability of quality laboratory medicine diagnostics in Africa.